Tinnitus is a ringing, buzzing, whistling, hissing or booming sensation in one or both ears (when no external sound is present) caused by an injury, infection of the ear organ, or a side effect of certain drugs, etc – it is pathological; meanwhile spiritual ringing in the ears has no medical cause – it is manifested through a higher dimensional energetic experience as elucidated below. For those that are presently pursuing the path of spiritual awakening aka ascension, the below thread is meant to shed some light on the prevailing controversy in relation to tinnitus and spiritual ringing in the ears. Ringing in the ears is the setting, fine tuning of our personal energy field/template (processor clock frequency) to the unity timeline carrier frequency/pilot, also called the Crystalline Grid Carrier as a result of the diverse recurrent Energy downloads – harmonics and side bands resulting from this calibration. A high frequency metallic hum of the rapidly oscillating higherchakras now perceived due to our extended range of audible frequencies. In reality chakras are energy centers aka frequency generators/oscillators; each chakra vibrating to a specific color/frequency and our resultant electromagnetic field called the aura being the synthesis of all the chakra frequencies. Ascension symptoms are an unusual body symptom that does not have a medical cause, which is the effect of a greater spiritual light/energy download in the body. A good spectrum of lightworkers who are deeply emerged in the transformation/ascension process (the shift) are experiencing these uncomfortable symptoms as a way to quickly transmute the old negative energies within Gaia as well as their physical vessel – a burning/releasing of old frequency patterns to allow the higher, more refined crystalline cells of consciousness to infiltrate and take dominion within. The grounding of this energy downloads from Source, Alcyone & Co goes a long way to heal the planet and all its kingdoms – expanded consciousness. These symptoms, whereby ringing in the ears features as one of the very prominent component are the result of deep physiological transformations at the cellular and metabolic level, which sometimes manifest as inflammation (digestive swings, bloating, sinusitis, vision, flu, joints, pains, +++). Our experiences of these body symptoms vary extensively (type, number, magnitude, frequency) depending on some of these aspects: our karmic load, mission/contract, wholeness (Light Quotient), environment – nutrition, air, exercise, etc. We all go through this process and symptoms in diverse ways, modes, intensity as they vary from person to person. We are all unique, on infinite healing paths, ascending and shifting in a multitude of ways – scenarios. Our body comprises four basic components – physical, emotional, mental, and spiritual. The etheric component is piloted by our chakra system – our energy centers/accumulators; the chakras are in effect frequency generators – Oscillators so to speak. During normal working life the energy that comes into our bodies from various ends: Source, Gaia, CME, Cosmic downloads, Shift, Grids, etc. is processed by our chakras and exit through our feet to Ground thereby giving rise to a resultant complex signal (wave) called our signature tone or registration. This energy field is unique for each individual. The electromagnetic field associated to this current flow produces what is called the Aura. Our signature tone is further enhanced or rather sustained by a constant signal called our clock frequency (identical to the microprocessor clock frequency of computers) indispensable in the stabilization and running of our etheric network. In reality, this clock frequency is locked (PLL – phase lock loop systems of electronic circuits) to a permanent carrier/pilot frequency (also known as the Beacon) received from Source (OM wave) – this is how our connection to Source is derived and activated. It is sad to mention here that conditioned souls have left this link/connection to atrophy hence the reason why our lives are so much in a shamble. Nevertheless, this link may become faint, deemed but it cannot be severed. Quantum physics has helped us to understand that every single thing aka matter in the Universe is comprised of Energy – Source as well (God is energy – Cosmic Vibration manifested as a vibration of an infinite Frequency). So the OM wave (omniscient moment – the Cosmic Vibrating sound), the God particle re Higgs Bosom, the Christ Consciousness Grid has its microprocessor clock frequency centered on 1034Hz (ten to the thirty forth power of pulse per second, Hz is the unit measurement of frequency). This frequency is of an astronomical value by virtue of the fact that it has to accommodate the signature tones of all entities/kingdoms in all the universes. This wave is also known as the fundamental frequency of all life. Our final objective on these myriad journeys to reconnection would be to raise our vibrations/frequency to eventually attain this value and become a fully integrated Christed being. Gaia is shifting and raising her vibrations analogous to the other kingdoms on planet earth and it is this frequency rise of her clock frequency that is responsible for the speeding up of time as we are now experiencing in 3D – the faster the microprocessor speed/frequency, the more versatile and rapid her tasks are executed; hence the notion of time speeding. The `Strange Sounds` some have perceived/reported of late from the core of the universe are frequencies and side bands resulting from Gaia`s shifting – Gaia`s ringing so to speak; the tearing apart of her present configuration in order to birth the new earth paradigm. This modulation is producing new elements of light/sound – the resultant harmonics of this split we now hear as strange sounds. Coordinated Universal Time (UTC) is the basis for modern civil time standard and it is set/follows International Atomic Time. Greenwich Mean Time (GMT) is an older standard adopted from Britain. For the world to operate on a unified time platform, it is imperative to have all the major clocks on the globe synchronized to one single accurate/stable clock piloted by the atomic time for precision – master clock. And this is achieved through connecting all clocks of major locations to the master clock by a wave called the pilot carrier. So the crystalline grid carrier interconnects all entities and serves the same purpose as the pilot carrier from the master clock to all other clocks. It connects all entities/kingdoms/expanded consciousness to the OM wave – the unity time line*. It then follows that our individual/local processors must be permanently connected to the unity time line hence lack of spiritual practice would considerably deem/diminish the quality of this link – our interaction with Source. The proverbial `little voice` is related to receiving from this ubiquitous transmitter – God is speaking to us all the time but if the quality of our link is compromised we would not reap full benefits. As we grow and integrate more light, as we strengthen our connection, the quality of our transmission improves (communication to and from Source) – more of the divine becomes available to us. The frequency of the tones, the ringing we now perceive will eventually drop as we continue stepping up our frequency – the shift, tuning/synchronizing to the higher frequencies of the Unity/Love harmonics (these high pitch tones is the result/difference between our signature tone and the Unity carrier frequency). At the tail end of the light body process the frequency of these tones will drop to 0 Hz – no tones, the Zero Point ; our heartily cherished Graduation. The amplitude of the said tones perceived depend solely on our individual sensitivities; hence the reason why some do not validate this experience – we are all unique. Ringing in the ears/high pitch tones therefore is the resultant frequencies (harmonics and side bands) perceived during the fine tuning/calibration of our clock frequencies/signature tones to the unity time line as we raise our vibrations to adjust to our new working points and as we upgrade or rather download ascension/light frequencies. If it were possible for us to actively connect to our subtle body, we would be able to hear this unity time line carrier permanently pulsing. Prayer/Meditation/Trance states are some of the methods we deploy here in 3D to monitor this grid/pilot/time line and taping into this signal would greatly enhance our LoA/Co-creational capabilities. A Harmonic is a single oscillation whose frequency is an integral multiple of the fundamental frequency, the partials of a fundamental tone. We are therefore harmonics of the Source, the Fundamental (All That Is) frequency – divine sparks. Harmonics are Holographic in nature hence they carry info/data/ID related to the fundamental (we are created in his/her image). *The above mentioned technique with reference to our connection to the unity timeline, to Source frequency has been implemented here in 3D by the global cellular telephone networks through the grace of the morphogenic resonance connection. Those that are alert enough will notice that when their phones are placed near a working Radio set, they receive a series of tones every several seconds depending on the provider; a kind of roll call so to speak – polling. These tones are transmitted from the cellular base stations/relays to locate the phone as we constantly move around – change our bearings. So the cellular network is in permanent touch/connection (can map) with all phones in their database. Also see: Do You Hear Perpetual High Pitched Frequencies? 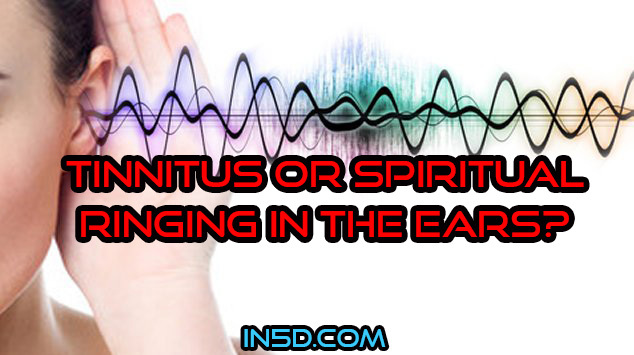 Tags: Tinnitus Or Spiritual Ringing In The Ears?